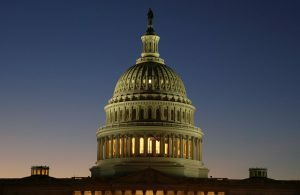 WASHINGTON — Lawmakers are giving themselves a one-week extension on spending legislation to keep the lights on in government, after the White House backed off a threat to withhold payments that help lower-income Americans pay their medical bills. It was the latest concession by the White House, which had earlier dropped a demand for money for President Donald Trump’s border wall. Even with Republicans in control of both chambers of Congress and the White House, the Trump administration is learning that Democrats retain significant leverage when their votes are needed on must-pass legislation. A temporary funding bill expires Friday at midnight, and GOP leaders late Wednesday came out with a short-term spending bill through May 5 to prevent a government shutdown this weekend. Votes on the short-term bill were expected on Friday. House Republicans also had a breakthrough on their moribund health care legislation when a key group of conservatives, the House Freedom Caucus, announced it would support a revised version of the bill. Their opposition was a main ingredient in the legislation’s collapse a month ago, a humiliating episode for Republicans that called into question their ability to govern given that they’ve been promising for seven years to repeal and replace President Barack Obama’s Affordable Care Act. Still, it was uncertain whether the caucus’ support would be enough. One important moderate, GOP Rep. Charlie Dent of Pennsylvania, dismissed the group’s about-face as “a matter of blame-shifting and face-saving” for a bill going nowhere. Even if the legislation passes the House, it will face major hurdles in the Senate and is certain to be extensively revised if it survives at all. The changes in the bill would let states escape requirements under Obama’s health law that insurers charge healthy and seriously ill people the same rates, and cover a list of specified services like maternity care. Conservatives embraced the revisions as a way to lower people’s health care expenses, but moderates saw them as diminishing coverage. Despite some optimism among House leaders for a quick vote on the health bill, the outcome was difficult to predict. The White House has been exerting intense pressure on House GOP leaders to deliver any tangible legislative accomplishments ahead of Trump’s 100-day mark Saturday, something that has yet to occur aside from Senate confirmation of Supreme Court Justice Neil Gorsuch. The spending measure, which would wrap together 11 unfinished spending bills into a single bill, represents the first real bipartisan legislation of Trump’s presidency. Democratic votes are needed to pass the measure over tea party opposition in the House and to provide enough support to clear a filibuster hurdle in the Senate, which has led negotiators to strip away controversial policy add-ons and ignore $18 billion in unpopular spending cuts submitted by White House budget director Mick Mulvaney. The outlines of a potential agreement remained fuzzy, but aides familiar with the talks said Trump would emerge with border security money that’s unrelated to the wall and a $15 billion down payment for military readiness accounts on top of $578 billion in already-negotiated Pentagon funding. Democrats won funding for medical research, Pell Grants and foreign aid. But negotiators rejected Trump’s demands for $1 billion to begin construction of his promised wall along the length of the 2,000-mile (3,218 kilometer) U.S.-Mexico border. And after a dispute between Mulvaney and House Minority Leader Nancy Pelosi, D-Calif., the administration agreed to keep funding cost-sharing payments under the health law that go to reimburse health insurers for reducing deductibles and co-payments for lower-income people.